This is my 250th post. Wow! To commemorate this special occasion, I’ve gone through my “archives” to highlight a couple posts geared specifically towards spring cleaning. A couple weeks ago when the sun emerged for a glorious week of bright beams and above freezing temperatures, I asked a few people their thoughts on the connection between spring and cleaning. Answers varied, but all seemed centered around the idea of having more sunlight and more heat. More sunlight and daylight, in particular, could result in higher energy levels giving us that much needed boost at the end of winter to do a thorough cleaning. Other people felt the cleaning was part of a natural transition from cold temperatures to warmer ones. This marks the time when we can finally put away all those bulky clothes and warm layers in favor of lighter garments. As for me, I find the angle and gleaming shafts of sunlight at this time of the year highlight the dust perfectly prompting me to engage in a deep cleaning frenzy. In the darker, colder months I’m not sure if I miss the dust because there’s not as much light, or if it’s a strategic kind of avoidance on my part. Either way, it’s all very apparent to me when I throw open the curtains to welcome those first triumphant, warm, rays of sunshine. If you’re feeling inspired to get started on your spring cleaning, here are a few posts to move you along in that direction. Getting Rid of Clutter – always the goal, but how do you accomplish it when you are confronted with personal items about which you feel sentimental? 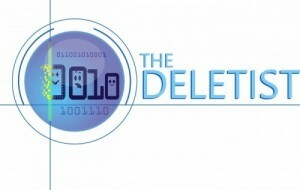 Read about The Deletist’s kryptonite and how I overcame it to get through my childhood belongings. Sprinting Through Clutter – for those of us that have the good intentions to get through that pile of “stuff” but somehow never seem to have enough time. 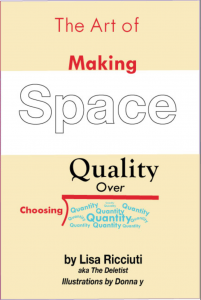 Coming soon, my new book, The Art of Making Space: Choosing Quality Over Quantity, guaranteed to help you overcome even the most pesky, annoying decluttering challenges you face with your physical and electronic belongings. Stay tuned for updates. Interesting! I had no idea you were writing a book! I just watched all my old VCR tapes to pick what ones to toss. Turns out I only want 5 transfered to today’s technology. Plus the VCR can go too! Good move! Those old VHS tapes break down over time so you likely wouldn’t be able to even view them in the near future.